It’s a beautiful blue-sky morning, April 5, our second day out from Cape Town, and in this fair weather, the science staff are settling easily into shipboard routine. We passed Cape Agulhas, which contrary to popular belief is the southernmost point of Africa, not the Cape of Good Hope, at about 0400. As of 0800, we were about thirty hours from Dr. Lisa’s study line. There’s a fire- and abandon-ship drill scheduled for 1020. In the meantime, let’s set down a few general principles of oceanography as context for her Agulhas Current Timeseries project. Motion is as intrinsic to oceans as wetness. Some forms of ocean motion—waves and tides—are observable from the beach. Waves are caused by the wind, and when the wind subsides, waves gradually relax. Tides are caused by the gravitational pull of the sun and the moon, mostly the moon because it’s nearer to Earth. But there is another profound kind of motion going on out beyond the horizon unseen by and largely unknown to the landsman. The ocean is everywhere on the move in the form of currents. They’re called ocean currents. That’s both a descriptive and a technical term. The Agulhas Current is one among many, including, randomly, the North and South Equatorial currents, the Kuroshio, Canaries, and North Atlantic currents, and best known, at least to those of us from the Northern Hemisphere, the Gulf Stream. Though they vary somewhat over short periods of time in velocity and though they meander and wander within limits, all ocean currents are permanent—that is to say they flow constantly in one direction. Some ocean currents flow north to south, others south to north, and still others flow eastward or westward across ocean basins. Some transport warm water and others cold water, but all do so in vast quantities. The Agulhas Current, one of the world’s fastest, flows south from near the Mozambique Channel (between Madagascar and Mozambique) transporting 70 million cubic meters of warm water—the equivalent in volume to 350 Amazon Rivers—every second of every day toward the southern tip of Africa. Alarm bells are ringing all over the ship. That’s what would happen in the event of a real fire or if the ship were in danger of sinking. This is only a drill, I’m pleased to say, but it’s taken seriously by all aboard. We grab our life jackets and our survival suits and gather at our pre-assigned “muster station” in the main lab. (We’re supposed to wear hats; I forgot that.) Our Chief Mate Dee asks us to check the strobe lights and whistles attached to the life jackets. She points out the location of fire extinguishers and explains their operation. If there were a serious, ship-wide fire, experienced crew would fight it. 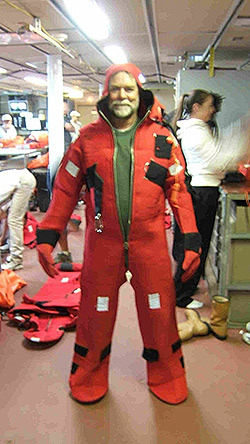 Then she asks us to don our survival suits, also called immersion suits (sometimes “Gumby suits”). These heavy rubber, one-piece suits with built in feet and gloves, hoods, and face closures are meant to keep us alive in cold water should worse come to worse. It’s easy to forget, since Knorr is so homey, secure, and powerful, that she’s still a ship far from land and that sometimes ships sink, which is of course why we hold drills. Dee leads us out onto the starboard side where we’d gather if we had to take to the life rafts. Knorr’s rafts are stored in plastic canisters rigged on an inclined ramp one deck overhead. You simply yank a lanyard, the canister drops overboard, and the raft automatically inflates. There are enough rafts to accommodate at least three times as many people as presently aboard. The short bells signal that the drill is complete. And so let’s return to the ocean and its currents. The currents we’ve been discussing, including the Agulhas, flow on the surface, though their influence often projects hundreds, even thousands of meters deep. They are permanent because the winds that drive them—such as the northeast and southeast trade winds—are permanent. Please note also that there is no such thing in any ocean as a solitary current flowing from here to there and ending the way a river ends at its mouth. Each is connected to the other to form a worldwide system of currents flowing on the surface and in the abyss. And so as far as nature is concerned, there is really only one world ocean. Those names we’ve ascribed to them—Atlantic, Pacific, Indian, etc.—for our own convenience is misleading. As this voyage of the Knorr continues, we’ll focus on the Agulhas Current, on specifically how and why we’re measuring it, but let’s keep in mind that it is linked to all the other currents. It collaborates with the other ocean currents to transfer heat from where there is too much (the tropics) to where there is too little (the polar regions) and back again in great interconnected circles. By doing so ocean currents moderate our climate, as we shall see. It’s early evening now, and Knorr is tracking eastward at good speed. Third Mate Bree is on the bridge. She’s keeping the ship south of the 200-meter-depth line in order to avoid the teeth of the west-flowing Agulhas Current. Wind is predicted to shift into the south-southeast and build to 25 knots, nothing serious, but when wind blows against a fast moving current like the Agulhas, waves tend to stack up and increase in size. We shall see. We should arrive at Dr. Lisa’s study line by tomorrow afternoon, and then the work will begin. We’ll talk with you in the morning.